Completing a small section of the Munda Biddi last year, Donnelly River Village became our start and finish, where we spent a night in between preparing and recovering from the bike journey. You can catch those posts here and here. We had such an awesome break in the old mill town that we decided to book a return. Not your typical white robe, pool or spa type of holiday. 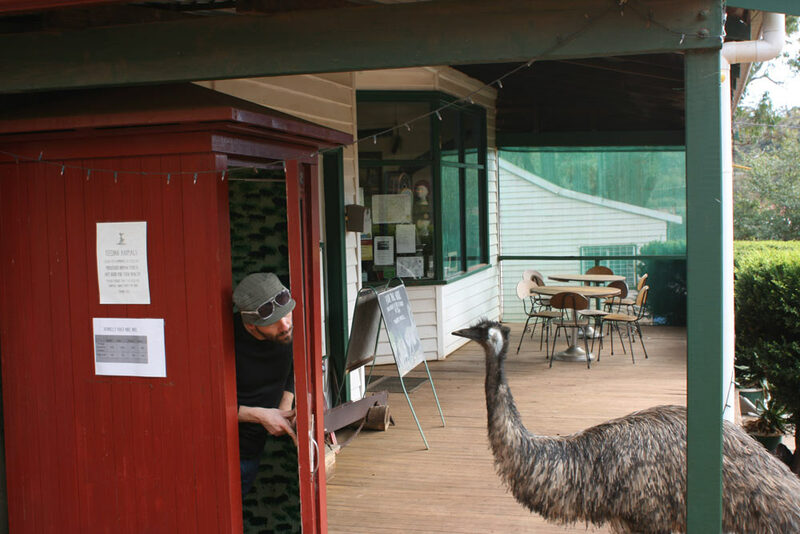 Donnelly River Village is essentially a rustic old world set in the middle of thick forest with nature activities galore. While the old mill town ceases to exist and is now a holiday place, everything is still here like the school building, the oval and the hauntingly standing mill which makes for some spine tingling ghost stories. 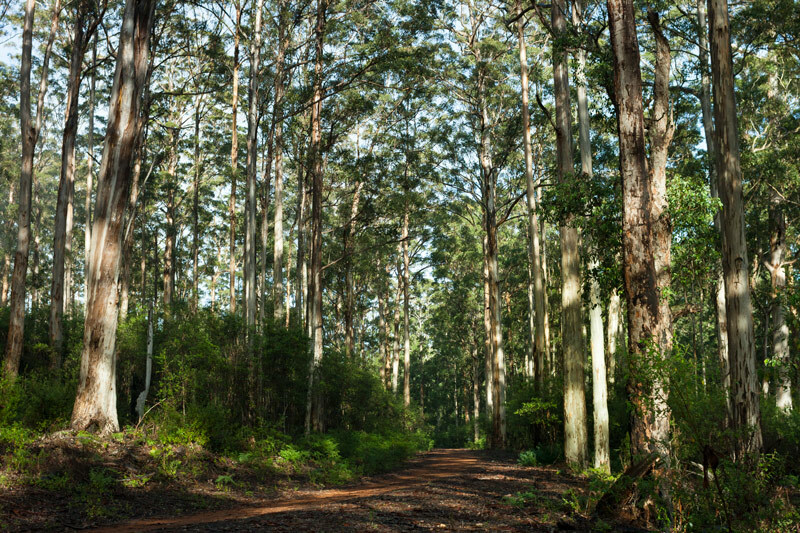 At the doorstep of our vintage cottage there are hiking and biking trails, friendly wildlife too. Bridgetown is not too far away and Barking Cow do great coffee and breakfast. 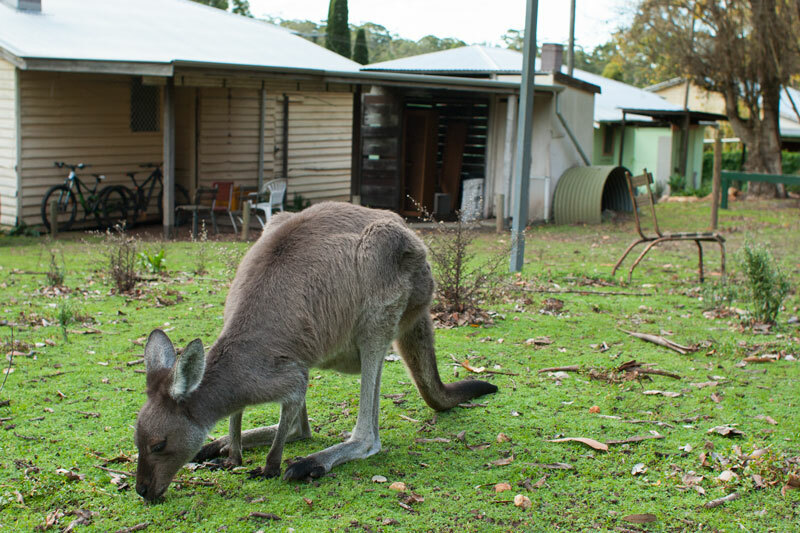 The attraction to Donnelly River village is entering the zone of zero mobile reception. Sometimes it’s nice to be disconnected and undistracted. No television as well, except for the butchers house but that’s over run by unsupervised kids. Infact, I think kids may rule this little section of the forest. 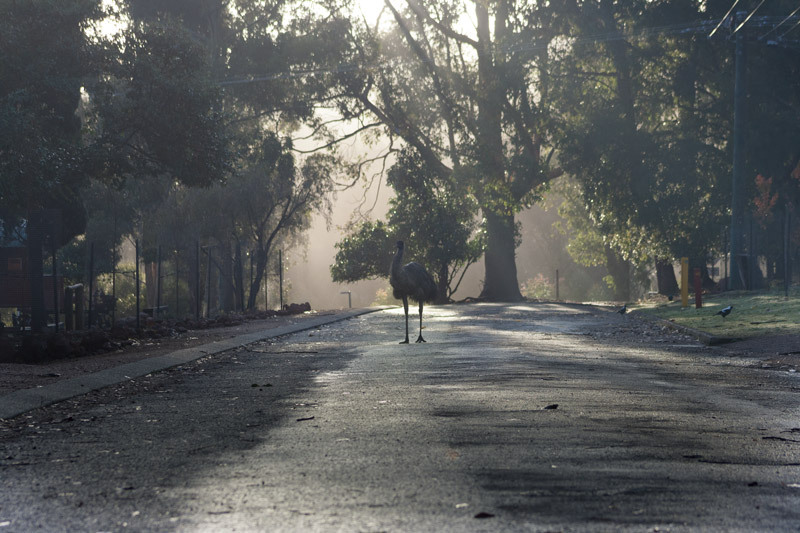 Even the kangaroos and emus follow them around. Isn’t that cool? 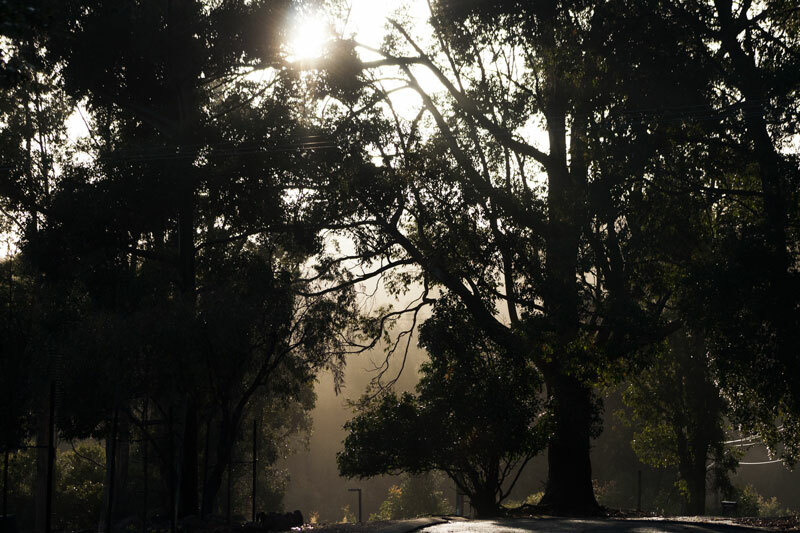 Sunrise lingers a little while longer in the forest, up until the moment the sun surfaces above the tall tree tops. 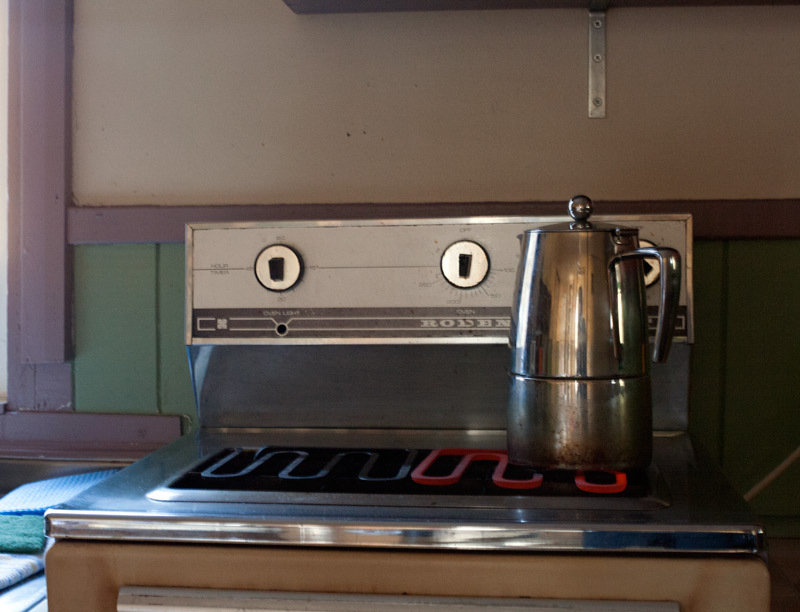 The morning begins with a brewed coffee and breakfast on the cottage veranda, until we discover it’s nice and warm standing on the street in the full sun. 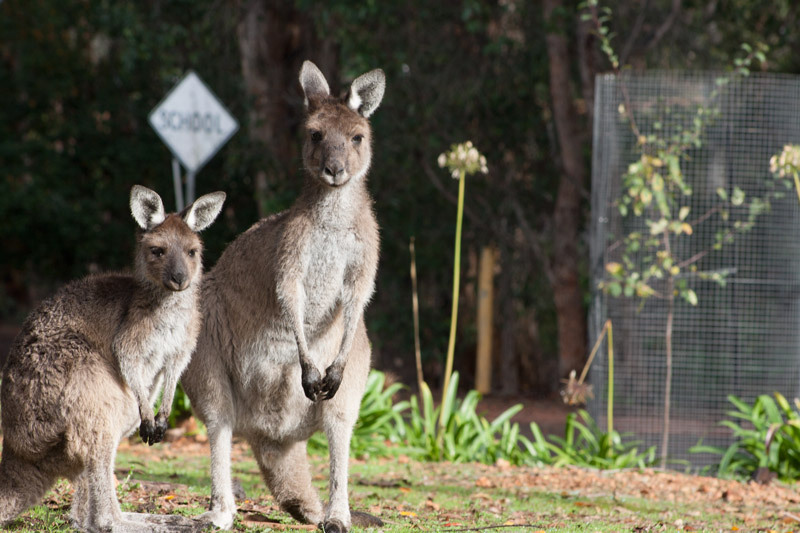 So, on the street in this holiday village there is us doing the cold dance with cups of coffee in hand, kids running to the general store, parents returning with cups of takeaway coffee, and all the while, emus and kangaroos leisurely passing by. It’s definitely a unique place to be! We head out for the day to the Pemberton Mountain Bike Park for some riding of the cross country and downhill trails. It’s super challenging and the steep terrain pushes a few limits. We were the only ones in the park – yay, the on and off rain may have been a deterrence. We head down the black trail, called Bloody Mary. 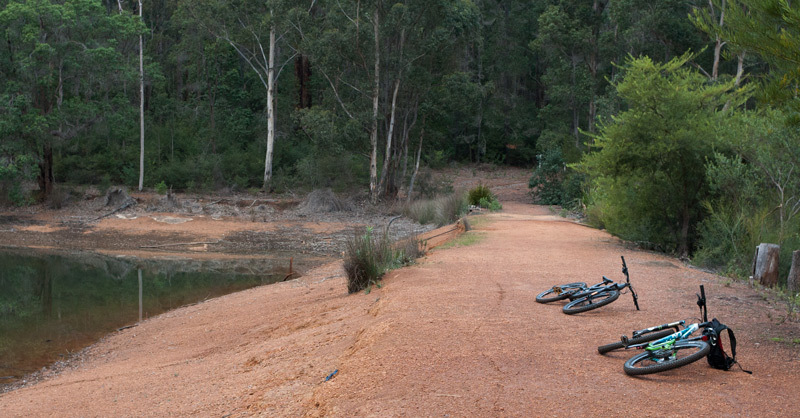 It’s epic, and experienced riders will love this trail, there’s even a couple of hair raising double black sections along the way. I encountered a new challenge on this trail – steep, tight downward berms. I was doing fine the first couple but then my confidence became a little shaky with the vertical position. I’ll keep to breezy blue level runs next time I think. 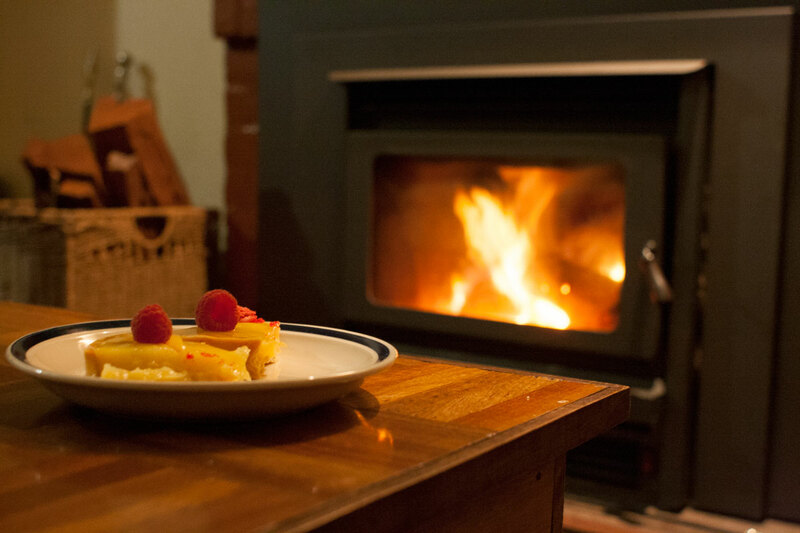 On return to the cottage, we snack, chop some wood for the evening fire and then set out on one of the trails from the village squeezing in a cycle before the sun disappears behind the forest, which is early in the cooler months, around five. 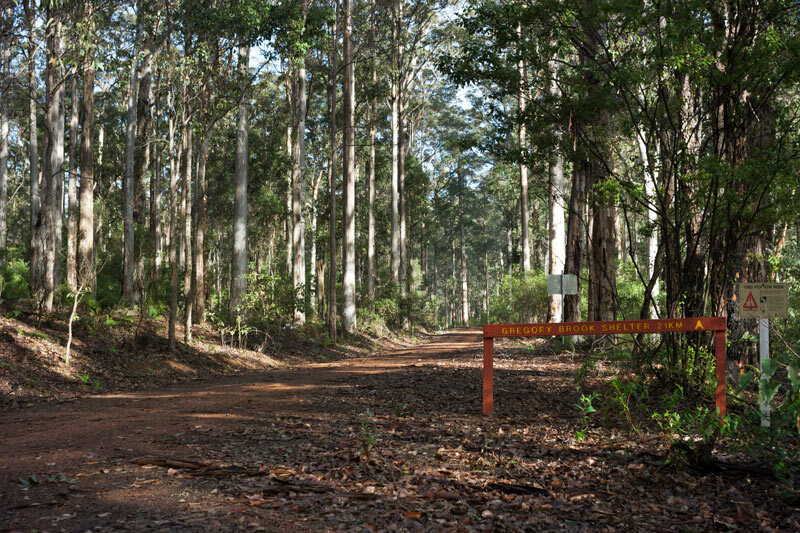 The Bibbulmun and Munda Biddi trails cut through the village so there’s plenty of forest to explore. 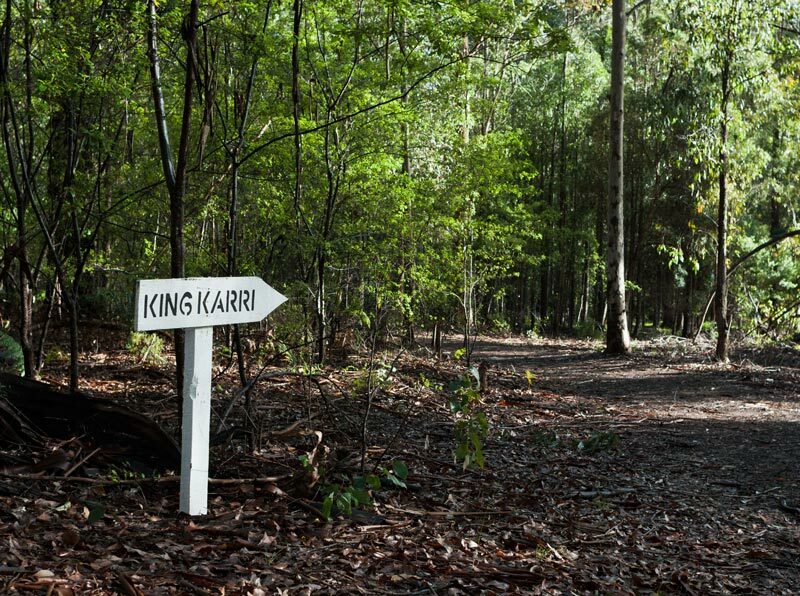 We cycle along the northern section of the Munda Biddi trail to check out the King Karri tree. The tree is massive and a few metres away we find a makeshift cubby house – as I said the kids rule this forest! The trail is slippery and recent stormy weather has stirred up the forest floor which makes for some bumpy riding. A couple of times we stop to clear the path. Towards the other way we cycle to the swimming pool and local dam, from here the village is only 300 metres by sealed road and as it’s getting late it’s an all too easy decision to return this way. Although the forest was more fun I didn’t fancy getting lost in the cold night without lights. A few days short of winter the weather is chilly in the south west and overnight the temperature drops below 10 degrees. Mind you though, it probably would be considered as mildly cold from someone of the northern hemisphere. We spend the evening by the fire playing scrabble and eating homemade burgers. Can’t say I do this at home, at all. But I should because it’s a really relaxing evening. I bought along a cake from Choux Café in Perth and we pig out on this. I should do this more at home too. Or maybe not. 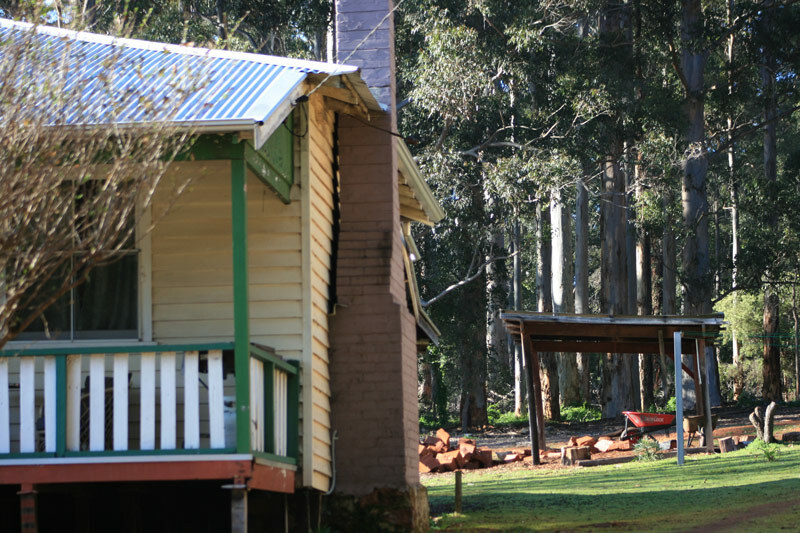 It’s been a VERY long time since I’ve stayed at Donnelly River but it looks almost exactly the same. We went down there with a big group and loved the fresh air and quietness. It’s so rustic and olde world-y……a big change for the usual up-market accommodation we all seem to choose now days.